Spruce and aspen trees growing on the dam on the east side of the Thomas Reservoir in Aspen. 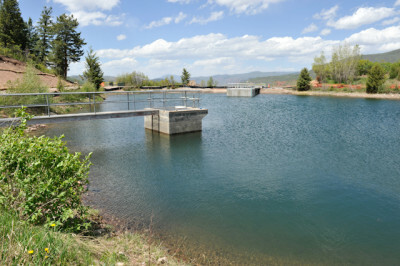 The pond-size reservoir is on the hill behind the Castle Ridge apartment complex and Aspen Valley Hospital. The worry is that if one of the trees dies and falls over, or is blown over in a wind storm, its uprooting could compromise the earthen dam where the trees are growing. David Hornbacher, the city’s director of utilities, said the municipal government will comply with the state’s directive and has filed for a permit from the city’s forestry department to remove the trees. 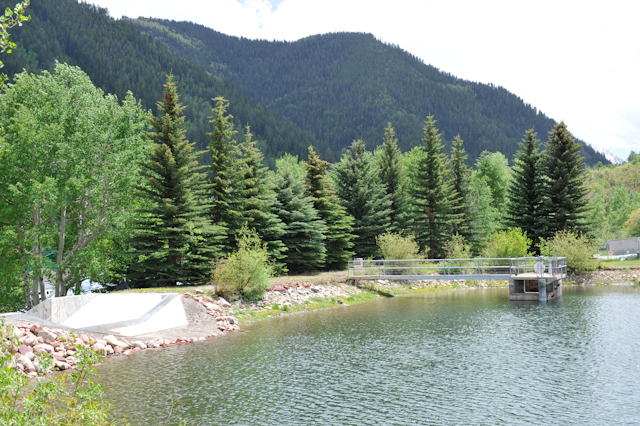 Sixteen Englemann spruce trees, ranging from 30 feet to 40 feet tall, stand on the east crest of the dam today, while nine aspen trees are growing behind the spruce trees on the lower face of the dam. The spruce and aspen trees range from 9 inches to 14.8 inches in diameter, according to Hornbacher. The city plans to have the trees cut down by September and hopes to have the tree roots excavated from the dam and filled back in by winter, according to Hornbacher. The city also plans to retain a consultant to review how best to excavate the tree roots while maintaining the integrity of the dam. “Should the results of this engineering review and plan recommend more immediate actions, the city will take further precautionary measures that may include drawing the reservoir down while accelerating the work to remove the hazard,” Hornbacher said in an email. The new spillway on the east dam on Thomas Reservoir. The trees in the background will be cut down and the roots excavated. Thomas Reservoir is closer to a pond than a lake. It holds 10 acre-feet and has a surface area of 1 acre, according to the state engineer’s inspection form. By comparison, Ruedi Reservoir above Basalt can hold 102,000 acre-feet at peak fill and has a surface area of 997 acres. The semicircular Thomas Reservoir dam is an earthen dam and is 280 feet long, 19 feet high, and 14 feet wide at its crest. It looks more like a large berm than it does a concrete or rock dam. Blair’s April 4 review of the dam was the first official state inspection since 1989. But last year, after the city and the state conferred on the city’s plan to install a 42-inch pipeline running out of the reservoir, the state reasserted its jurisdiction over the dam and changed its classification. The pipeline is intended to feed a hydroelectric power plant that would be 4,000 feet down the hill underneath the Castle Creek bridge, as well as serve as an emergency drainline for the reservoir. The city is currently seeking federal approval for the power plant. The state changed the classification of the dam and reservoir from “no public hazard” to “significant hazard,” primarily because two public housing projects — Twin Ridge and Water Place — have been built below the reservoir since 1989. From July to December 2011, crews from Western Summit Constructors worked to install an outlet structure and the 42-inch pipeline. On Feb. 27, the state reviewed and approved the work and gave the city the OK to refill the reservoir, which had been drained for construction. “However the large trees on the downstream slope of the old east dam, which was not part of the modification, [are] a concern,” Blair wrote. “The associated root systems penetrate into the [old east] dam,” Blair told the city. “When the vegetation dies, the decaying roots can provide paths for seepage that could lead to a possible piping failure of the dam. Hornbacher said cutting down the trees and filling in the holes their roots will leave behind will eliminate the concern. The city's Thomas Reservoir holds 10.3 acre-feet of water. 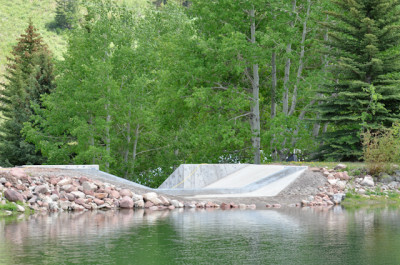 The new outtake structure for the city's emergency drain line/penstock is visible on the far side of the reservoir. Rob Covington, the raw water and hydroelectric supervisor for the city, responded to Blair via email on April 13. “I will be moving forward on correcting the deficiencies in the report immediately,” Covington wrote. “The items that are still part of the construction contract will be corrected by Western Summit Constructors starting in May. Convington’s email is the only official correspondence from the city in response to Blair’s letter that was in the files at the Division of Water Resources office in Glenwood Springs the week of May 21. There were also 10 other items that Blair said needed “action by owner to improve the safety of the dam,” but they were more modest in scope than removing the trees. Editor’s note: This story was developed in collaboration with the Aspen Daily News and was published in the paper on Friday, June 1, 2012.